Recently our home has been undergoing some major renovations and although they’re not finished I am beginning to see the hard work paying off. We renovated our kitchen/living room cabinetry and counters to bring it forward from the 1970’s into what I feel is a light, clean look. 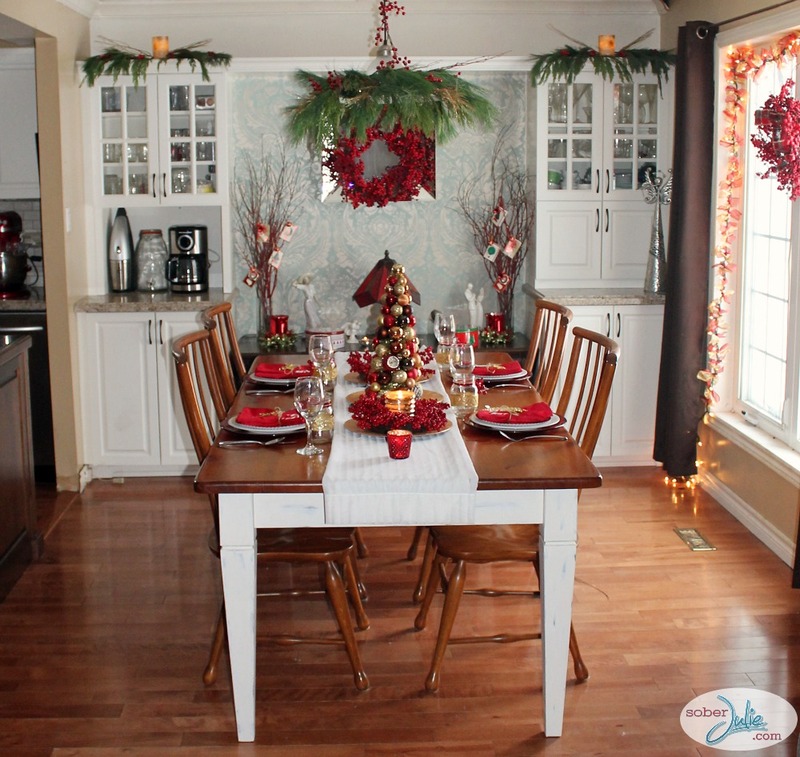 With the Christmas season almost upon us, when Home Depot gave me the challenge to choose an area of our home to decorate I chose the dining room as it’s one of the spaces where we spend the most time. For this challenge I decided I’d go with a Cozy Country Christmas look, I just refinished our dining room table using clay paint and the theme fits perfectly! Starting from the top of the room, my first challenge was our UGLY light fixture! This was in the house when we moved in and we haven’t gotten around to replacing it but oh how I hate it! I knew I wanted to cover it up with something festive, so I picked up some greenery and make a GORGEOUS Christmas Chandelier Wreath. It’s a very simple project actually, which you can do with any hanging light fixture so head over and see how we did it. On top of the cabinetry we have some space which eventually I’ll paint to match the open concept living/dining room, for Christmas I wanted to put something there which will help the room feel more cozy. 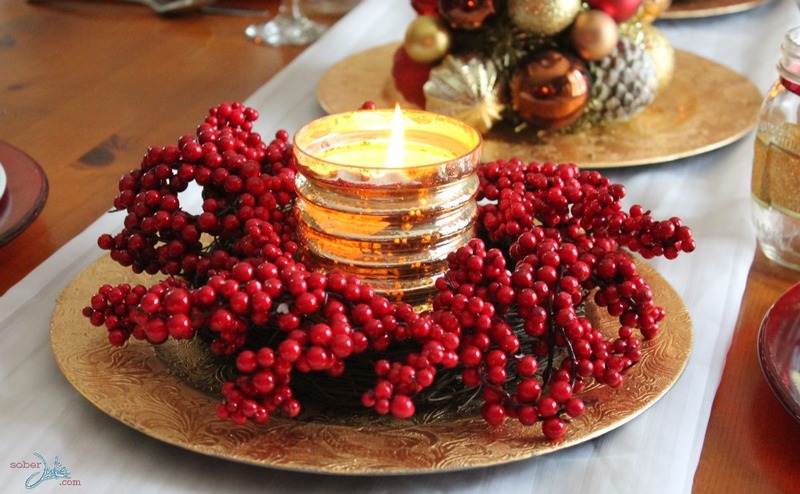 I used the Home Accents Holiday 6″ Birch Wax Flameless LED Pillar Candle as the centre point, draped the fresh greenery around, added some dollar store gold branches and cranberries it to create a lovely, festive accent. This can be done for a mantle as well, just ensure you hide the stems of the greenery by placing other greenery pieces on top of it. During our dining room renovation, we decided to have our cabinet maker build two cabinet pieces, between which is an antique hutch from my husband’s family. Between the cabinets we used a wallpaper from Home Depot to create a feature wall and hung a simple square mirror there. 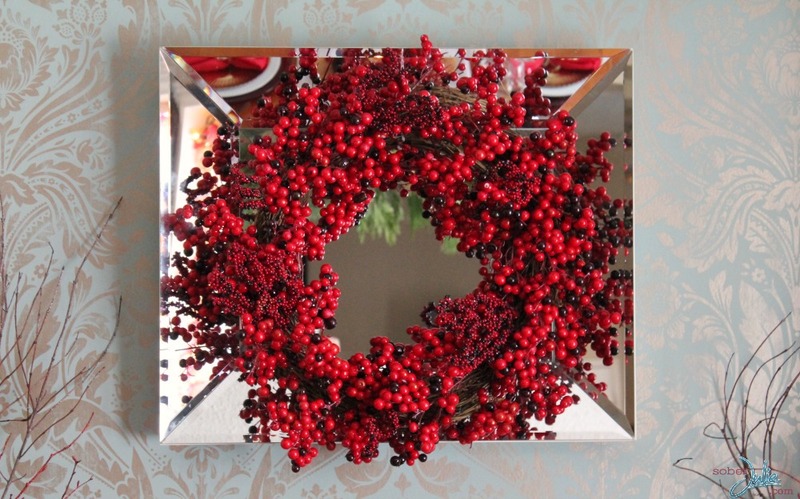 When I saw the 24″Martha Stewart Living Berry Wreath at Home Depot, my wheels began turning and I knew I wanted to hang it over the focus mirror. To do this, I simply looped fishing wire around the top of the wreath, knotted it and ran it to the over the top of the mirror to the wire on the back of the mirror. I tied it in a knot securely to the hanging wire and voila, I had a gorgeous focal point! To highlight the buffet area where I will serve the desserts, I placed some coloured branches into vases and had the kids write Christmas wishes on little cards which I hung there. I left the lamp and figurines which sit there all year long as they seemed to fit the mood. Just a few candles and we were feeling festive over here! Isn’t that wallpaper from Home Depot gorgeous? Next up was the table! To begin, I actually folded up a curtain which I had lying around to create a table runner. Then I used 3 inexpensive gold chargers as bases for the 3 table features. 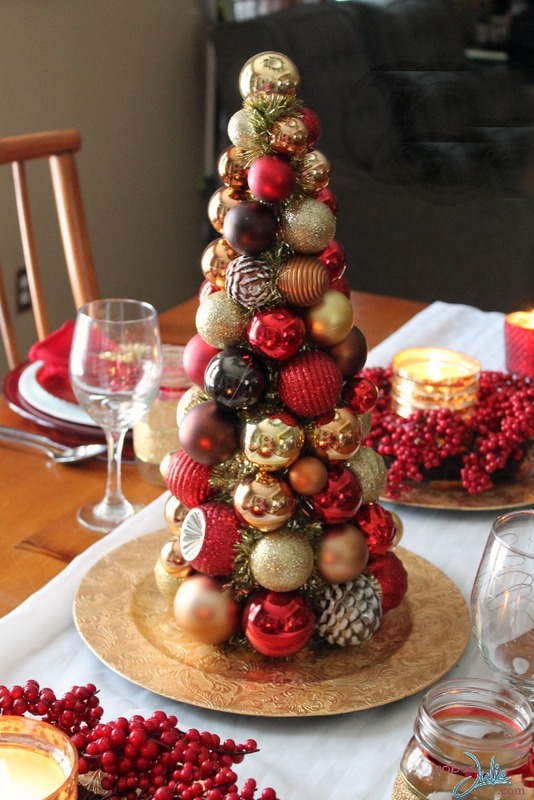 When I was in the store, I fell in love with this Martha Steward Red and Gold Tree and decided to make it the table centrepiece. I love how it’s colourful and brings a shine to the centre of the table. To flank the centerpiece at each end, I found cranberry wreaths at the dollar store which I placed on top of the gold chargers and placed a candle in the middle of each. 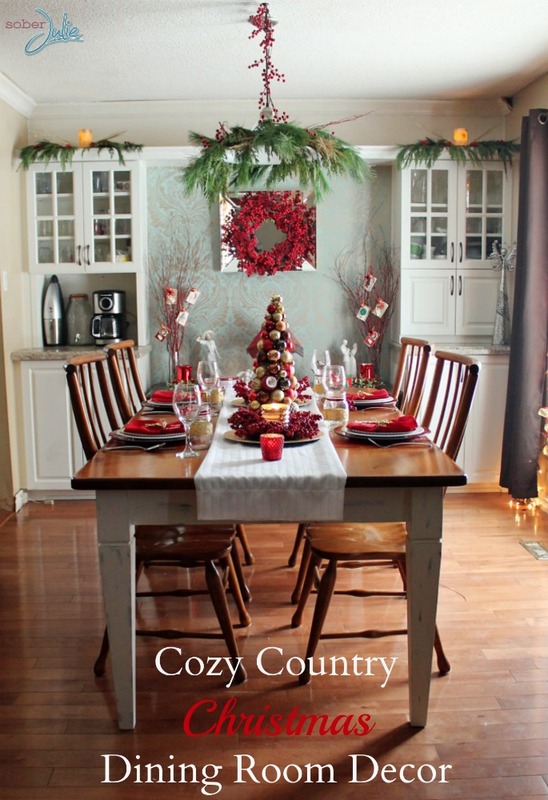 This is simple, inexpensive and really fits well with the cozy theme. For each place setting, I used red chargers as the bottom then a simple white plate and finally a gold dessert plate to complete the colour scheme. 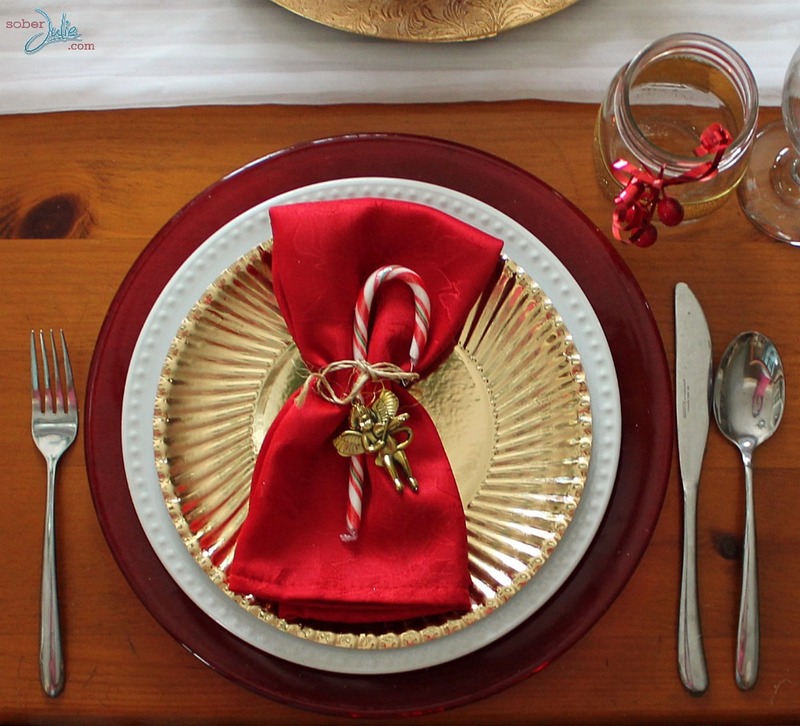 I placed a candy cane upon a folded red napkin, added a little ornament and tied with twine to finish it off. Anyone who knows me, knows that beverages matter to me! I love serving guests Mocktails made with fresh ingredients so of course I had to decorate my mason jar glasses! This is super simple, just the way I like it! 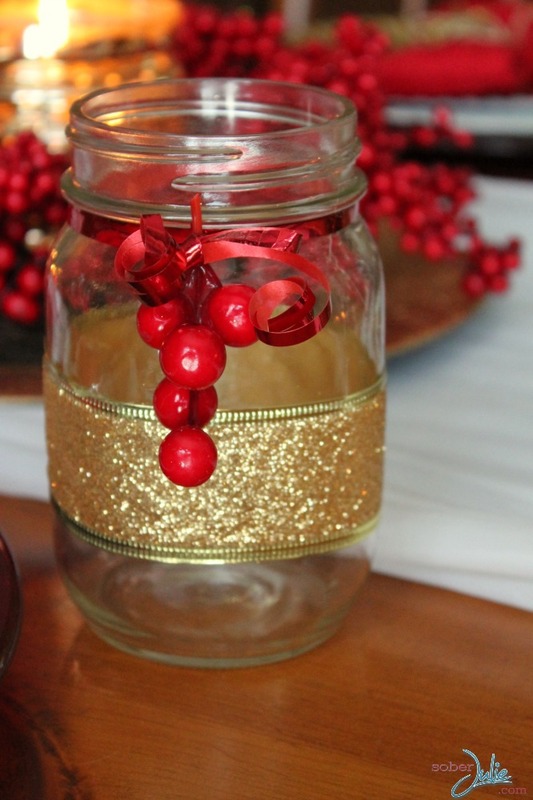 I simply hot-glued some pretty gold ribbon onto each glass, tied a red ribbon around the neck and fed a cranberry twig into it. Isn’t it lovely? 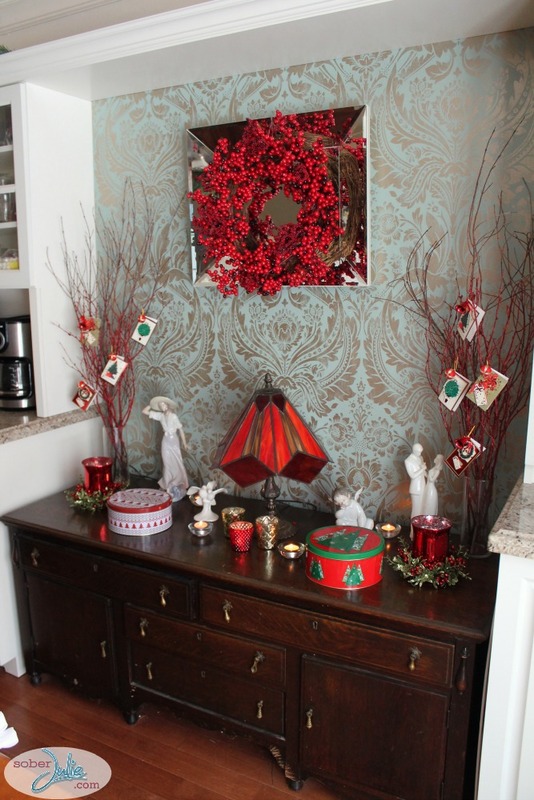 This project was so much fun, when I began I knew I wanted to achieve a “cozy country” look for Christmas and by using the cranberry wreath and more modern looking Martha Stewart tree as my inspirations, I feel we have a dining room that hits the mark! I would love to be at your house for a Christmas diner or to sit for coffee in the kitchen to get into the spirit, which evades me this year, our house looks amazing! Gorgeous! Like you just popped out of a décor magazine! This is gorgeous! The table is so elegant. Like I said on Facebook your room looks like it came straight out of a magazine!!! it’s gorgeous and you did an awesome job!! Very nice dining room. i like all the reds. Ready for Christmas. 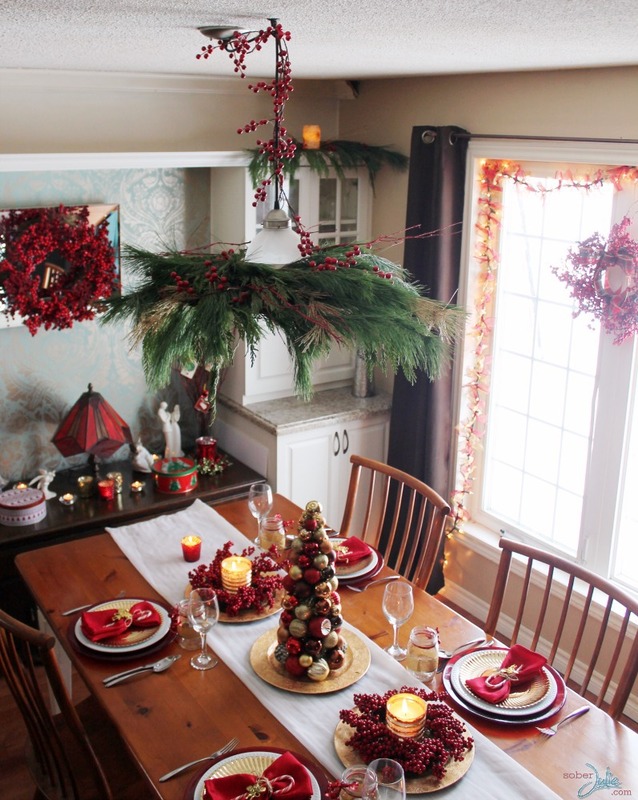 I am in love with your dining room Julie especially the holly and greenery! Beautiful decorations. I wish I had a flare for decorating. I love the chandelier. Congrats on a job well done. Oh my gosh this looks straight out of a magazine. 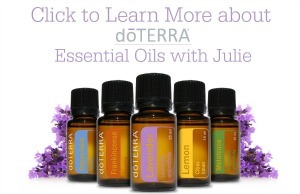 What a great job, Julie! Absolutely beautiful, I love all that you have done. SO BEAUTIFUL! Julie, I love how festive your home is. Such a beautiful touch. This looks like it’s taken right out of a magazine! Gorgeous! this is picture perfect, want to come to my house and decorate? 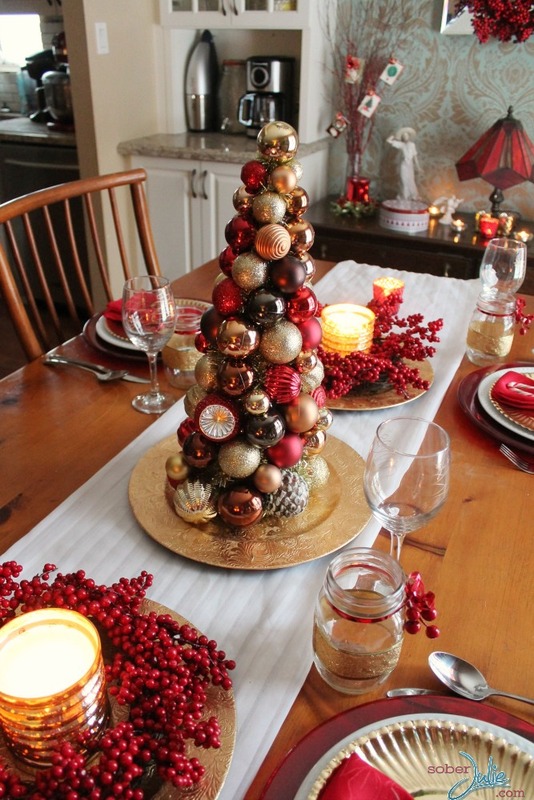 Love your Holiday decor it is to die for and your table turned out fabulously! 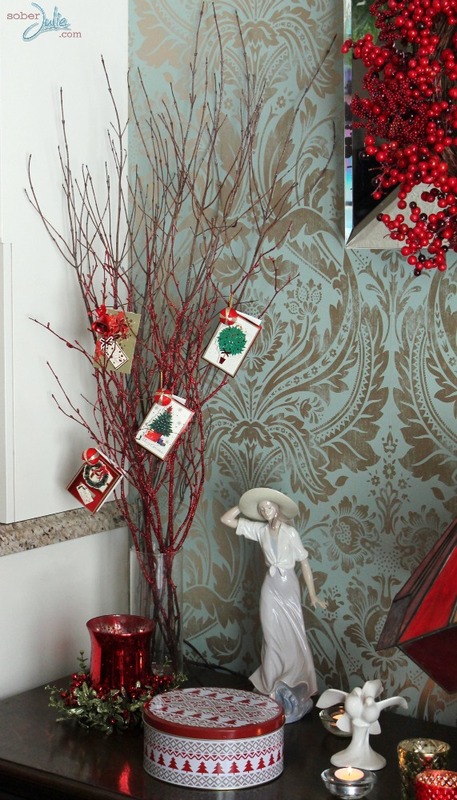 I love all of these wonderful pictures and ideas…especially how you have displayed your Christmas cards…I have been looking for a decorative way to display ours and this just looks great and affordable. Absolutely gorgeous! I love the rustic feel!